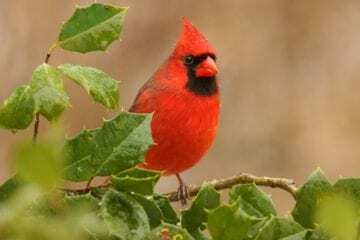 When it was time for me to walk on, I noticed that my heart was full with the few moments of interaction I had with the cardinal, and I wondered about the synchronicity of thinking about the gift of blessings and then running into this beautiful bird. Cardinals are special to so many of us, and I always consider it a gift when I’m able to spend some time close to one. There are people who would say it’s just a coincidence that the cardinal was there and I wouldn’t be able to argue with that. I might remind them, though, that Carl Jung talked about synchronicities as “meaningful coincidences”—that they aren’t causal but they are meaningful to the people who encounter them. What this got me to thinking about is how powerful it is to allow ourselves to be aware of the small gifts a day might bring as we move from here to there, going about our everyday activities. And, I thought as well about the nourishment that can come from these small gifts. For example, my encounter with the cardinal reminded me of the intricate dance we engage with nature and the world around us, that we are connected to one another in a beautiful, and mysterious, way. This isn’t the meaning someone else would probably put on this kind of experience, but for me it became a source of inspiration and nourishment. For this week’s practice, I invite you to pay even closer attention to the small gifts that come into your experience perhaps in the most mundane of ways. Then, as you notice these moments or brief encounters as the gifts they can be in your life, invite yourself to become aware of how your psyche and body respond as you take in the gifts that have been offered to you. The key here is to take time to notice the truly small moments that inspire or nourish you, as I think they are all around us all the time. For me, being aware of the dance of synchronicity and the small gifts that emerge in the course of almost any day deepens my sense of connection to the world around me, and that always fills my heart and body with a kind of settling and nourishment that I treasure. As with all these practices, there’s no right way to do this one. Instead, be sure to bring along curiosity as your constant companion and allow yourself to pat gently on the head any judgments that may arise as you move through your daily activities.